"Up, Up, and Away! Chapter Two: Mild-Mannered Reporter"
Had such a good time yesterday in the One Year Later-verse... let's go back for more! Well, Lex Luthor might be a free man... but it's here we learn that he's no longer an affluent one. Despite his exoneration, public perception still paints him as guilty... and having become "too hot to handle" for his board of directors, he's been ousted from his own corporation! He doesn't appear to be terribly bothered by this, however, and is keeping himself busy tinkering away in his lab... that is, until his work is interrupted by the arrival of... Superman?! 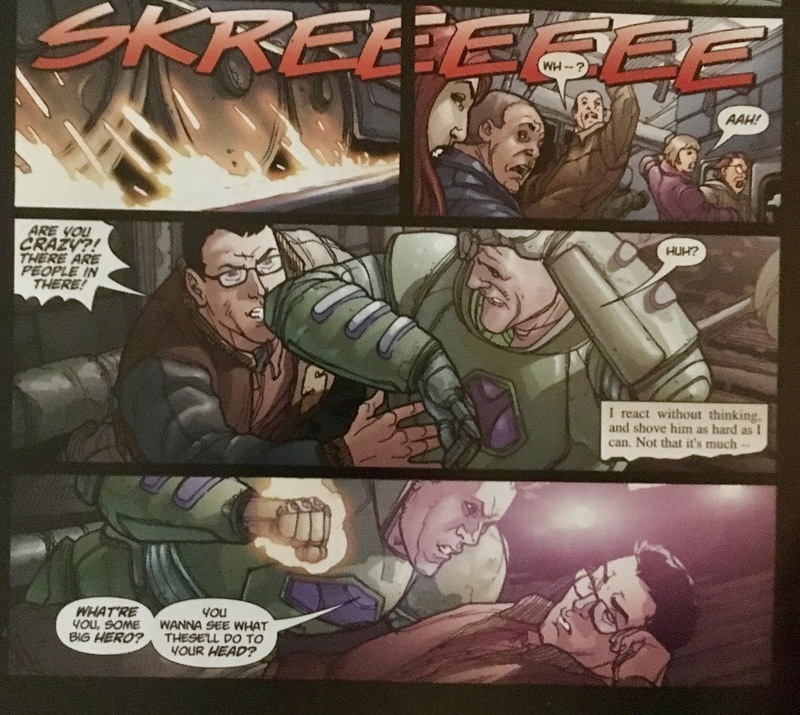 Well, no... it's actually the Toyman controlling a Superman robot... the last one standing after their deactivation following Graduation Day. 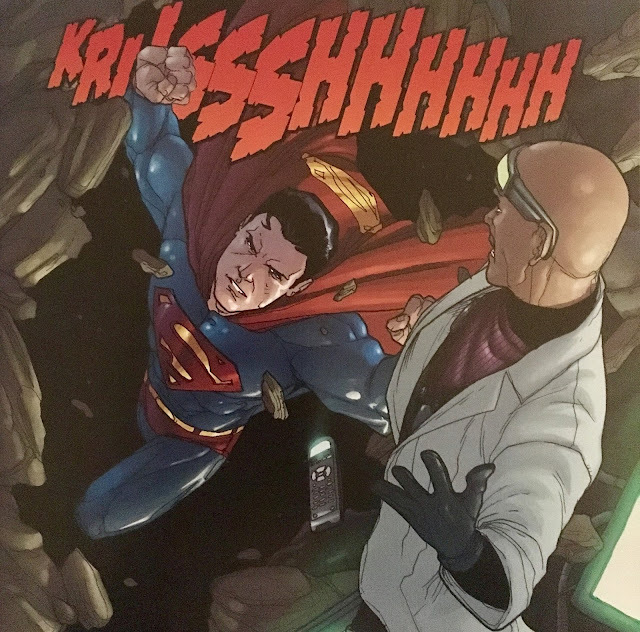 Luthor produces that shard of glass from last issue, and claims to have found it at the ruins of the Fortress of Solitude. Considering that there's some Kryptonian etched on it, I'm willing to believe him. 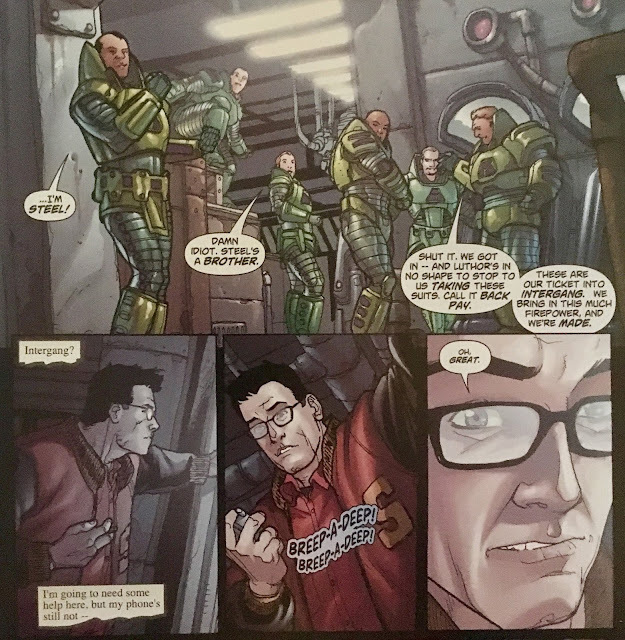 He asks Toyman to visit the Prankster and inform him that his powers will be needed for the next step in his plan. We shift over to Lois and Clark's apartment, where the latter is icing his swollen face. Lois wonders why Clark didn't just beat Luthor up... after all, even depowered, Clark is an impressively-sized dude. He tells her that his "fighting back" will be continuing to publish articles. The two chat for awhile on the balcony... and in a neat twist, we learn that Clark's glasses are no longer just part of his disguise. Later that day, we rejoin Clark at Metro Square where he plans to continue his investigation. He's found that several inactive subway tunnels have been regularly maintained... and figures that's as good a lead as any. He follows lucky track 13, and comes upon a group of goons wearing variations on Lex Luthor's Warsuit! Unfortunately, ol' Clark forgot to put his phone on vibrate, because it starts to ring, giving away the fact that he's there. The baddies give chase, and Clark... answers his phone?! Well, yeah... because on the other end are Hal Jordan and Hawkgirl, and they're here as back-up. Amid the fracas, one of the Luthor goons takes aim at a train loaded with passengers. Without even thinking, Clark pounces... and finds himself looking directly at the business end of the baddie's fist. 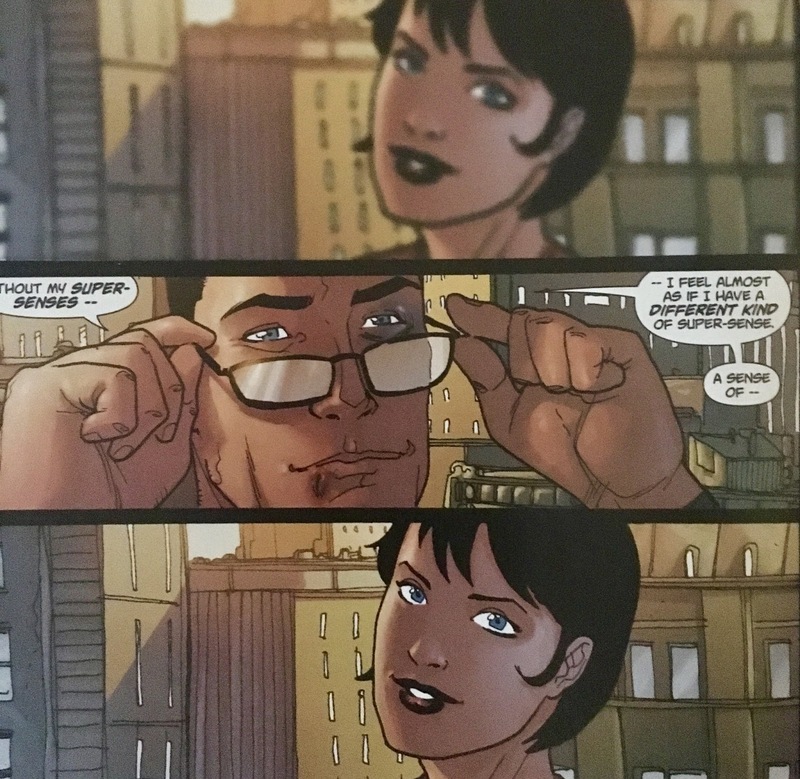 Hawkgirl is able to swoop in and bring Citizen Kent to safety. We rejoin Luthor at Centennial Park where he's stood before a the Superman Memorial... which, after the events of Infinite Crisis, features a Superboy statue as well. It looks a bit different than it did back in 1992-1993... smaller, and without a tomb underneath. 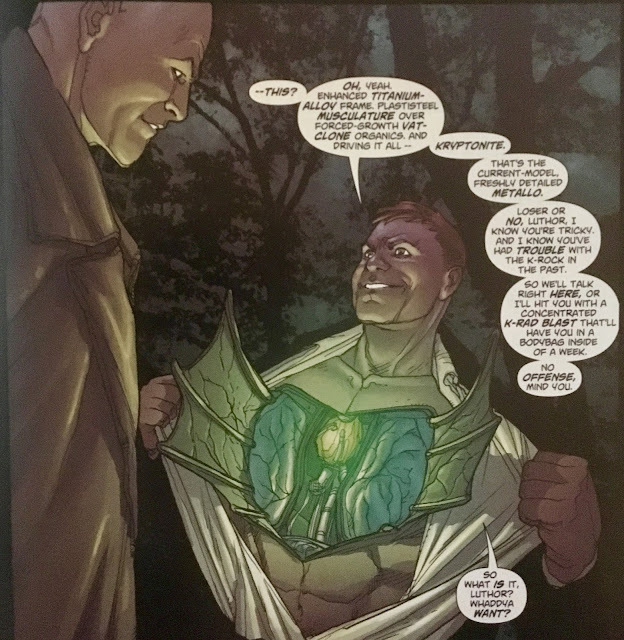 Lex is eventually joined by his next contact.... Metallo! Another piece of the puzzle falling into place. 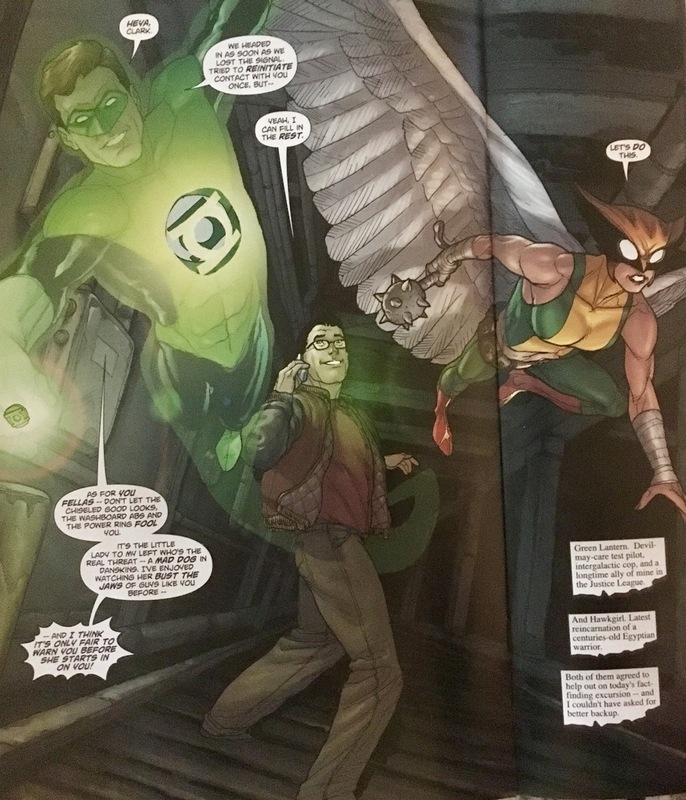 We wrap up with Clark chatting with Hawkgirl and Hal. Jordan suggests it's time Kent got "back into the game", and produces a power ring with a Superman logo on it. Another strong chapter for "Up, Up, and Away!". 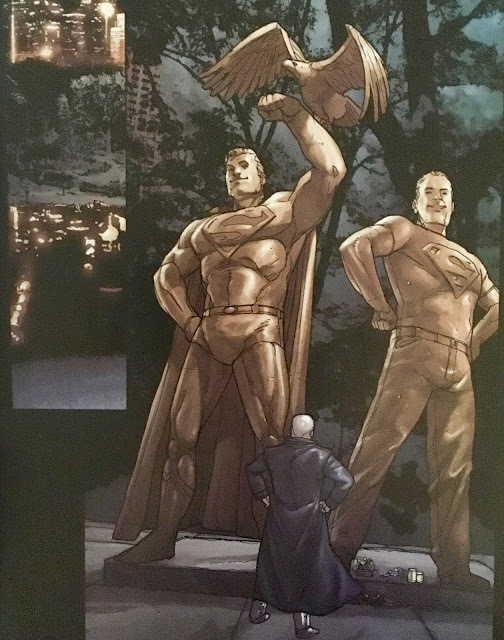 I enjoyed this issue on both fronts... let's talk the Luthor strand first. I really dug it, however, this sort of story kinda set the precedent for so many Superman stories that followed. It's a team of baddies organized by a bigger-bad. 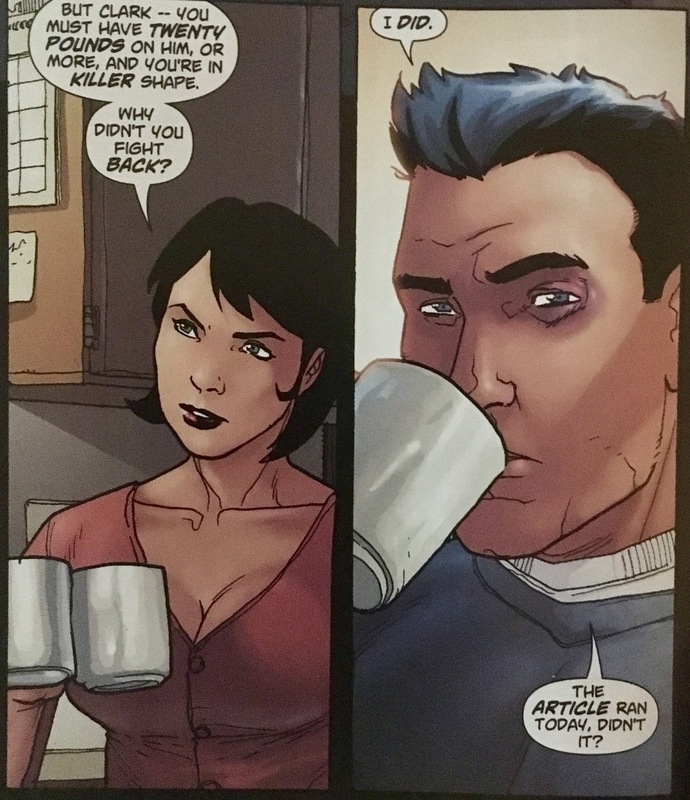 Seems like we get that kind of Superman "template" story on a yearly basis these days. 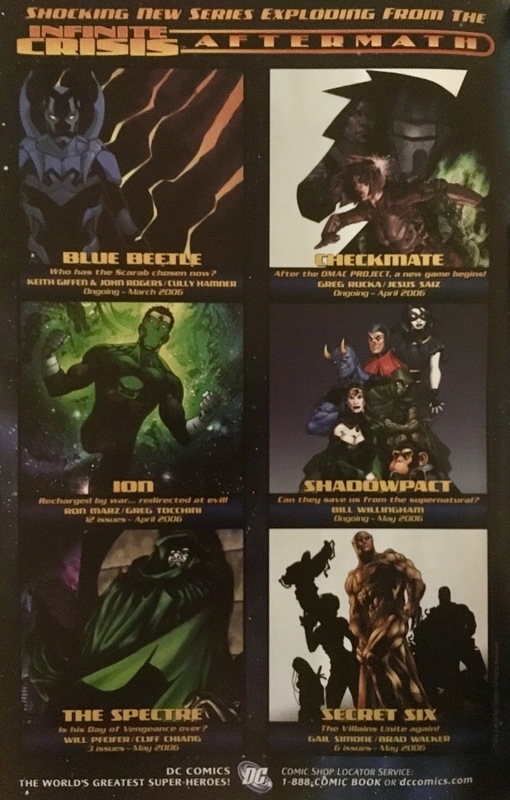 Two or three issues of shady team-building... ramping up the odds, and then a big fight. It's not a bad story... just one that feels overdone at this point. 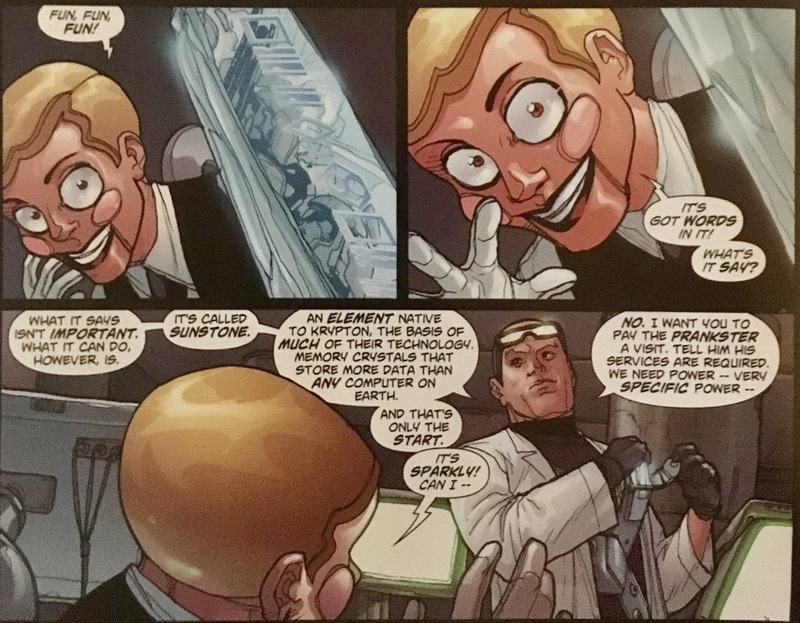 Lex as (comparably) destitute opens up some interesting avenues for storytelling. He's been dead... but he's never been poor, and there's that old saying that the most dangerous person is one who has nothing left to lose. 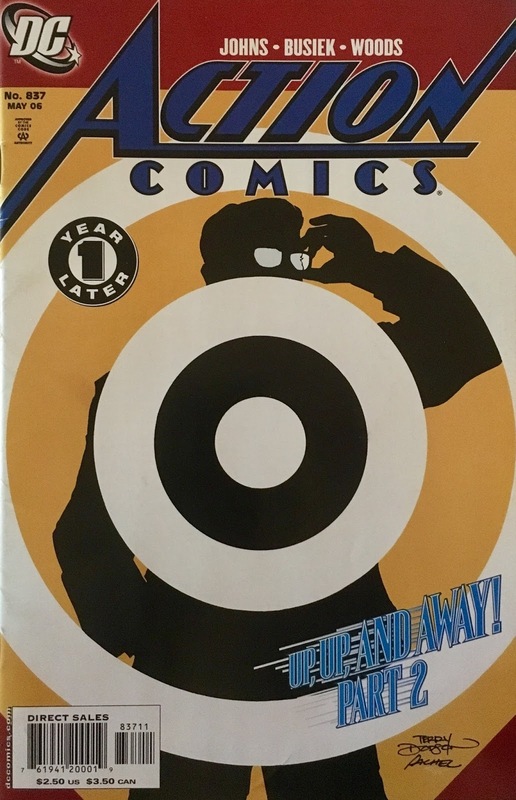 It's been... yeesh, eleven years since I read this run, so I don't exactly remember how it all plays out... but I'm hopeful that this aspect gets a bit of exploration. Later in the subway, we learn that acting like a hero is a tough habit to break. Even without his powers, Clark didn't have a second thought about leaping into action. This was something noticed by Green Lantern too... he notes that Clark is a "man without fear". 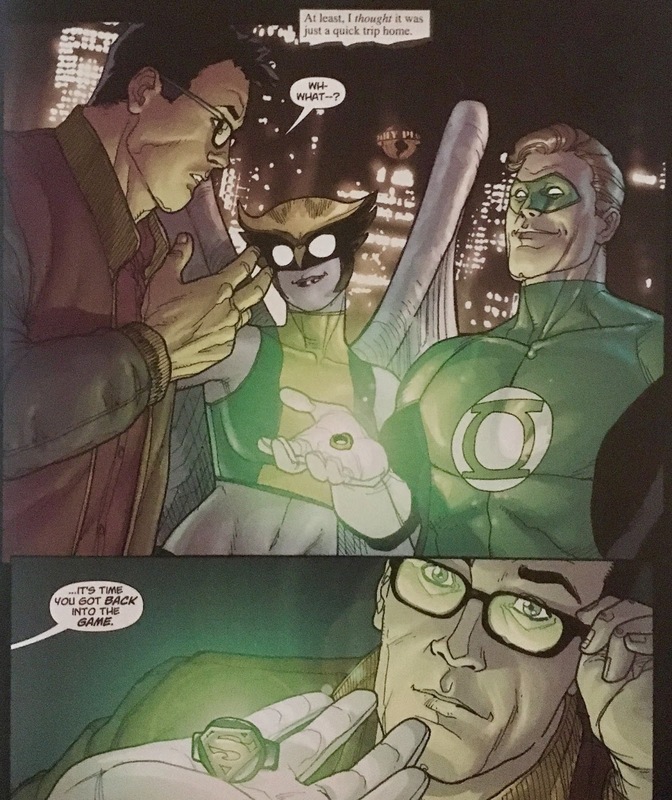 I thought that could've just been a throwaway line, until the end... Hal offers our man a power ring of his own! I'm having a heckuva good time revisiting this one... it's from a time in DC history where everything sorta just blobs together in my brain... so, it's really cool to take a second look and compartmentalize everything that's going down. Already looking forward to the next part. I agree on this period being a bit of a blob in memory. 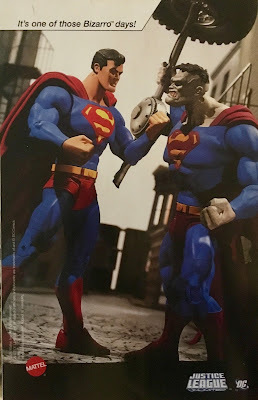 I remember reading these as they came out, but in thinking back on the story now, I find myself seeing it as the moving-away-from "my" Superman of the '90s. Of course, given everything since...not bad. Too much to read, but reading your coverage scratches that itch a bit, and I look forward to the rest of your covering of the story! As to Clark leaping into action even without the powers--I always think of that scene with the giant subway rat or such in Superman #50--where the subway lost power and then the creature's there, and he wraps his coat around his arm and gets between it and passengers. 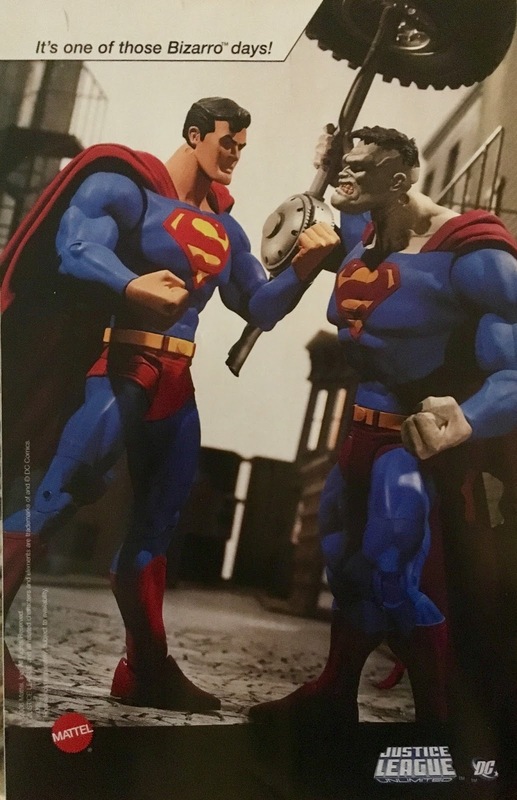 Regarding that ad of the action figures...I believe I still have both of those--Superman and Bizarro. Back when they were maybe $9ish each, where they'd be probably $25 nowadays (and that's in places like Walmart and Target, let alone non-discount chains).